Western Lake District is the most remote and least visited part of Lakeland. Within its boundaries are the hidden jewels of Buttermere and Crummock Water and the sombre Wastwater, which is the deepest of all the lakes and lies in the shadow of England's highest mountain. This simply glorious 5 day valley to valley walk includes the option to bag some of the big peaks including Grasmoor, Great Gable and Scafell Pike. Alternatively you can admire them from below as you follow ancient trading routes across the passes that connect these remote westerly valleys. We arrange comfortable accommodation in en-suite rooms at hotels and accredited guest houses on your route and we transfer your luggage so your bags are waiting for you when you arrive. Prices are per person based on twin share and include all accommodation in twin share rooms on bed & breakfast basis, luggage transfer, information pack including maps, route guide, and our emergency contact. Single rooms are available. We only apply a supplement for single accommodation when there is a direct cost to us and we cap this in line with our ‘Fair pricing’ policy. 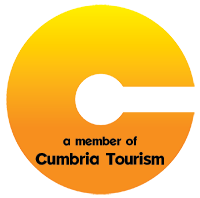 Solo walkers pay a supplement of £15 per walking day, plus any single room supplement which may be required. Arriving in Keswick you check into your comfortable accommodation and can explore this interesting town, the capital of the North Lakes. There is a wide variety of restaurants, cafes, bars and pubs to choose from for your evening meal. If you arrive with time to spare, a visit to the lake or to the ancient stone circle at Castlerigg are well worth it. After sailing across Derwentwater, today's walk skirts around the shapely ridge of Catbells before ascending Rigg Beck into the wild country below Sail and Knott Rigg. You then follow the Sail Beck and Mill Beck down to the extraordinarily picturesque hamlet of Buttermere where you check into your hotel for a 2 night stay. 6½ miles. 1715ft ascent / 1567ft descent. After crossing the lake to Hawse End landings and walking around the end of the Catbells ridge to Littletown, you make an ascent of Robinson the most prominent of the Western Fells from Keswick. From the summit there are extensive views over the western , northern and southern fells. You now descend via High Snockrigg to Buttermere where you check into your hotel for a 2 night stay. 6½ miles. 2658ft ascent / 2510ft descent. A delightful walk following a varied trail which for the most part skirts the shoreline of this very pretty lake. With several hidden gems along the way this is probably the finest lake shore walking in England. Start and finish at the door of your hotel. 4½ miles. 445ft ascent / descent. An ascent of Grasmoor (2795ft) via the pointed peak of Whiteless Pike (2165ft) and Wandope (2533ft) and finishing through the hidden 'bluebell valley' of Rannerdale. 7 miles. 3444ft ascent / descent. A sensational traverse of the Western skyline of the Buttermere Valley. Beginning with a climb beside the Lake District's highest waterfall, you will follow Lingcomb Edge to Red Pike (2479ft.) and then by a series of high linking ridges you make the traverse of High Stile (2644ft.) and High Crag (2443ft.) to Scarth Gap, before returning to the village along the shores of the lake. 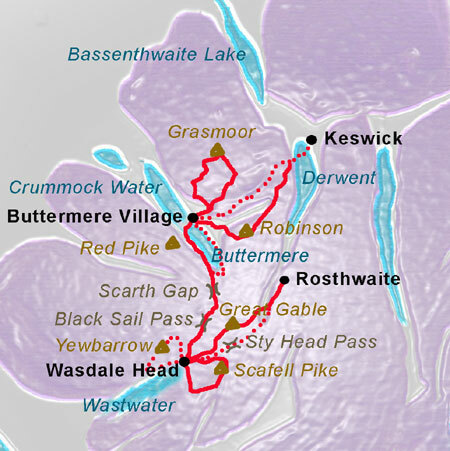 There are further options to extend this walk to take in Haystacks or Fleetwith Pike. 9 miles. 3175ft ascent / descent. Leaving Buttermere you cross two passes to reach Wasdale, the most westerly and most remote of Lakeland valleys. Climbing from Buttermere you first cross the Scarth Gap to drop into Ennerdale and then passing the Black Sail hut, possibly England's most isolated youth hostel, you then cross the Black Sail Pass before descending to Wasdale Head and your overnight accommodation for the next 2 nights. As for option 'A' as far as Black Sail Pass. There is the option to increase the challenge today with an ascent of Pillar before descending to Wasdale. 8½ miles. 3455 ft ascent / 3395 ft descent. As well as being the most remote, Wasdale is arguably the most rugged of all Lakeland valleys. It is also given the status of being the birthplace of modern British climbing and it is no coincidence that Wastwater and the peaks that frame its head were chosen to represent the whole district as the logo of the National Park. Yewbarrow which forms the south-western end of the famous Mosedale Horseshoe, is leftmost silhouetted fell on the Lake District National Park logo. 4½ miles. 2045ft ascent / descent. A real highlight of this Western Lakeland trek is this traverse of Scafell Pike, England's highest peak. Using a different route for ascent and descent makes for a thoroughly interesting and enjoyable day. A track climbs unerringly across the stony flank of Great Gable below the Napes Needle to the pass of Sty Head. Below the pass on the other side lies a quintessential mountain tarn which invites you to tarry as you look back to the heights of Scafell Pike. From the tarn you follow a trail beside the beck which tumbles in a cascade to the stone-arched bridge over Stockley Beck and from here make your way to the farm at Seathwaite. From here the Allerdale Ramble is followed to the hamlet of Rosthwaite in Borrowdale where you can catch a bus into Keswick and check in to your final night's accommodation. 7 miles. 1650ft ascent / 1615ft descent. 7 miles. 3045ft ascent / 3010ft descent. Let us know if you require a transfer to Penrith station and we will arrange this for you (at extra cost). A Wandering Aengus information pack containing all necessary maps, a current guide book or our own weather-proof route cards, laminated locator maps for each night's accommodation, and our own weather-proof 'info cards' with local information - including locations and opening times of restaurants, cafes, ATMs, supermarkets etc. The nearest railway station is at Penrith on the main North-West rail link between London and Glasgow. From Penrith there are taxis and a regular bus service to Keswick - a journey of 16 miles. On each day there are at least two options offering a relatively moderate walk with a more demanding alternative or two. All options reach the same place at the end of the day so you can mix and match as you go along depending how you feel when you set off each morning.